An open letter by Iranian reformists and activists calling on the Islamic Republic leaders to hold “direct and unconditional talks” with the United States have drawn angry reactions from military commanders, clerics and politicians inside Iran. “Making compromise with American is tantamount to the demise of the Islamic Revolution and the biggest loss to the people and regime,” Major General Ali Jafari, the chief commander of the Islamic Revolution Guards Corps (IRGC) was quoted as saying in the Iranian media. “These individuals harbor non-revolutionary and non-Islamic thoughts,” he continued. The IRGC chief accused the signatories of the letter of having sided with Washington against the Iranian nation. Mohammad Nabi Habibi, the secretary-general of conservative Hezb-e Mo’talefa-e Eslami (Islamic Coalition Party), criticized the letter and claimed that direct talks with the U.S. harms Iran’s national interest. Several clerics also blasted the activists, with Ayatollah Abbas Kabi calling them “the fifth column”. Comment: Iranian media reported on Sunday that 100 Iranian activists, most of whom live abroad, had written an open letter calling on the Iranian government to hold direct and unconditional talks with Washington to deescalate tension between the two countries and seek to potentially resolve their differences diplomatically. 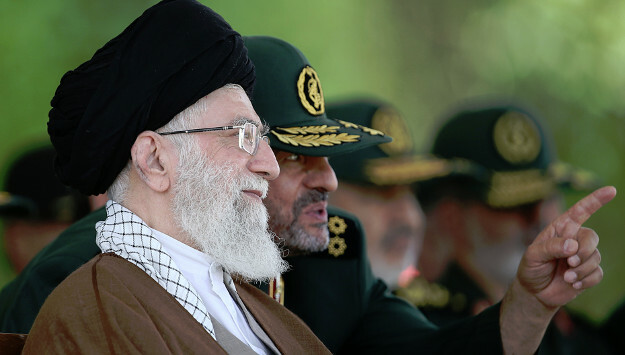 The hostile reactions from IRGC leaders and hardliners were expected. But it is worth noting that reactions from Rouhani Administration officials and reformist politicians were equally, if not more, critical of the letter – indicating that reformists, centralists and hardliners in Iran are now largely united in rejecting any direct talks with the Trump Administration. For example, Ismail Dosti, a member of the central committee of reformist Hezb-e Etemad-e Melli (National Trust Party) called the letter a “treason”. Mohammad Bagher Nobakht, a spokesman for the Rouhani government, said it was “unacceptable to signal to an America with untrustworthy president that we want to hold talks”. He added that the signatories of the letter lack political wisdom. After the Trump Administration withdrew from the Iran nuclear deal, it said it would be willing to negotiate with Tehran for a new, more comprehensive deal that would address not only Iran’s nuclear activities but also missile program and regional policies. Tehran has rejected the offer and instead works with European powers as well as China and Russia to preserve the existing nuclear accord, in an effort to minimize the impact of U.S. sanctions.